The Orangevale Colony didn't exactly materialize as quickly as planned. This partial 1892 USGS map shows the actual roads and features that existed in about 1890 when the survey was done. USGS maps were surveyed and accurate, and contained none of the imaginary features that the developer's maps showed. The full source map is at the US Geological Survey website. 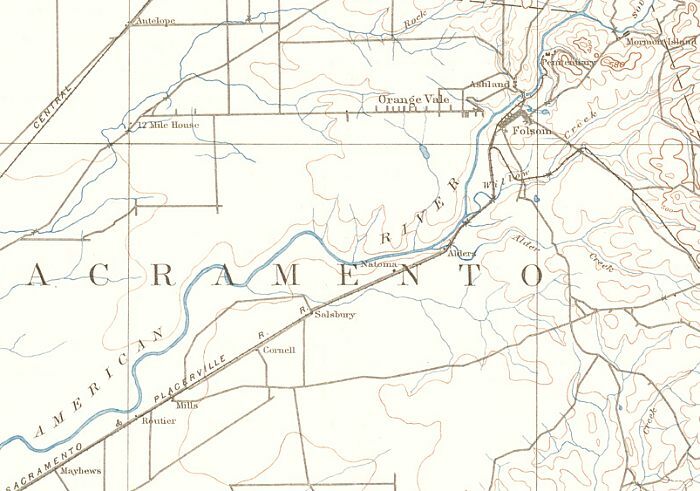 There are a number of familiar names on the map, notably the railroad stations along the route from Sacramento to Folsom. Also notice that the Fair Oaks road to Sacramento doesn't exist on this map. It was probably too rudimentary to be considered a road by the surveyers. If you remember our landmark "S" curve on the river (right at the second "A" in SACRAMENTO), you can look north and see the beginnings of San Juan Avenue. The east-west road to Orangevale is Greenback Road, and the east-west street below 12 mile house is what would become Winding Way.